W L Wyllie (1851-1931). Watercolour signed (lower right) with Admiralty censor's approval (verso) dated 15/3/16. 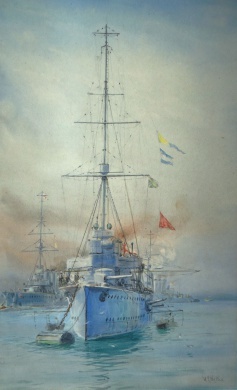 Entitled by Wyllie "These cruisers look very peaceful until a wireless call reaches them" this is one of the few Wyllie watercolours that sees the light of day in 2017 - for most are horded and stored in museums or are in private collections from where (quite understandably) they are seldom allowed to escape! This one is in cracking condition with not a spot in sight and signs of only very slight fading even though it's some one hundred years since it was painted . It's a magnificent and relatively large watercolour portrait of the Harwich cruisers who worked so hard at sea and achieved much in the years between 1914 and 1918. As was so often his way, WLW didn't date this painting but we are helped here by the reverse of the watercolour board which is stamped by the Chief Censor, Admiralty, and dated "15/3/1916". Also in his blue pencil the censor has ticked the box "Passed as cut" but has qualified this with a hand written "delete names" and initialled the stamp "DB or DJ" (hard to tell). Mr Wyllie has complied and clearly then rubbed out the offending names as the eraser 'skid mark' is just visible - but more significantly, he didn't do a thorough job and the offending names are just about discernible! Under a bright light and with a magnifying glass one can just about make out what are pretty certainly, from left to right, the names of ARETHUSA and UNDAUNTED - there's more writing there too but its not easily decipherable.